Melbourne Streets Avant-garde. Survival Day. flickr cc. The new minimum wage rate has come into effect on 1 July. The Fair Work Commission (FWC) recently announced an increase of $18.29/hour, or approximately 3.3%. Inevitably, the decision failed to satisfy any of the vested parties within the Australian Industry Group representing employers seeking to limit the increase to $10.10/hour, citing weak economic conditions, and the ACTU seeking $45/hour, citing high living costs, job insecurity and inequity. Least of all could it have delighted the 2.3 million, or nearly one-in-four workers, who rely on the minimum wage to support themselves and their families. As our SPC Board member, Danusia Kaska writes in Eureka Street, homelessness has many faces. Yet while many of us associate homelessness and poverty with those reliant on social security payments, the fact is that a significant proportion of those, almost a third, rely on wages as their main income. Moreover, the causes of homelessness and poverty are not simply economic. There are strong correlators not just with income, but also with mental and physical health, domestic violence, substance addiction, and so on. How is it that Australia, which recently outperformed other OECD countries by recording 25 consecutive years of economic growth, could have such a significant number of wage employees falling under the poverty line? Among the 36 OECD countries, we are but a middling performer when it comes to poverty rates, yet, as the ‘lucky country’, we should expect to be ‘lucky’. Wages policy and FWC determinations clearly play a part, but they are not the full story. Business practices contribute, with many large companies currently under orders to meet obligations for underpayment of wages, and others under audit. These are not inconsequential sums. The 7-Eleven Wage Repayment Program alone is currently addressing claims of almost $115 million! Tony French’s article Consumers, cowboys & cops gives further impetus to the need for the business sector to act responsibly and pay heed not only to profits, but to the common good of the very society on which it is dependent. Ex-prisoners find it exceptionally difficult to resume employment and their place in society. As Captain Jason Davies-Kildae from the Salvation Army writes, improved supports would greatly reduce the personal toll, as well as the financial cost to the community. Many Indigenous Australians also face additional obstacles in life, even from measures purportedly designed to help them. 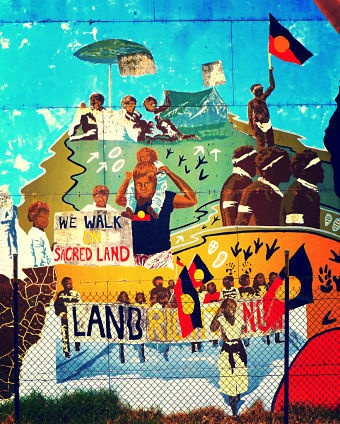 Diana Perche examines why the Howard government’s 2007 Northern Territory Intervention was misconceived and announced without consultation even with the NT government. Dr Cassandra Goldie, CEO of ACOSS, in the Poverty in Australia Report 2016 calls upon Australian leaders and Australians generally not to place the responsibility for poverty solely on individuals, but to see eradicating poverty as a shared societal responsibility. A proper response to the eradication of poverty in Australia will require not only a new approach to social policies, labour market policies, and minimum-wage setting, but also an increase in collaboration between the major political parties, as well as between government and the business sector. Of course, this is a tall order. But if it were easy, it would already have been done. Undeniably, Australia can do much more than it does to alleviate and eradicate poverty in our midst; if we are to remain the ‘lucky country’, then we must empower our leadership, support them in the effort, even when there are costs associated with that effort, and continually hold ourselves responsible for improving the lot of those impoverished in our midst. This is entirely in keeping with the social thought of the churches, including the Catholic Church, over the last 125 years. Bruce Duncan, in A Scorecard on Pope Francis, examines how Francis has emerged as a leading opponent of extreme free-market ideologies, blaming them for growing inequality and poverty. Despite critics of his encyclical, Laudato Sí, the Pope is relying on the thinking of many leading scientists and economists.